Forty years earlier, a man committed suicide in a stolen car at this farm at the end of the road. Like a fuse on a firework, his death lit a touchpaper and resonated in unimaginable ways. The darkness was unleashed, something scary and thoroughly incomprehensible to a little boy. And Lettie - magical, comforting, wise beyond her years - promised to protect him, no matter what. 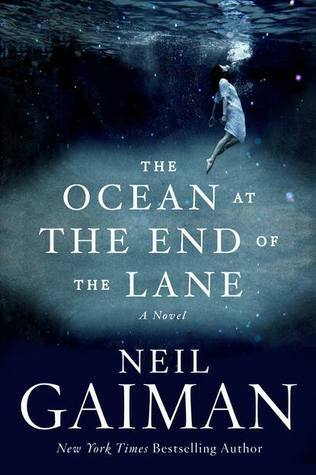 A grounbreaking work from a master, The Ocean at the End of the Lane is told with a rare understanding of all that makes us human, and shows the power of stories to reveal and shelter us from the darkness inside and out. It is a stirring, terrifying, and elegiac fable as delicate as a butterfly's wing and as menacing as a knife in the dark. When people ask me for book recommendations, my answer always falls on some form of "go for Neil Gaiman. You can never go wrong with a Gaiman book". Now, I will not say I have read everything of his - I most certainly have not. But ever since I read my first Gaiman book that I have known I could rely on his stories if I ever needed a friend. This book only served to show me how right I am. Though I have always loved Gaiman, I often feel like there is something, some tiny little thing, in his books that I cannot understand. Like that strange shaped object behind your closet that you can see, sometimes even scrape the surface of with your fingertips, but not grasp. It has never kept me from loving his books, but it has always been a nagging sound in the back of my head. Ocean, however, I did understand. Cliché as it may sound, I did not feel like I read it. I feel like the child I was, the one I still am, and Gaiman himself were speaking it to me. More than once, I caught myself thinking "I remember what this was like", sometimes "and it did not change." Author Patrick Rothfuss wrote in his review of Ocean, "Sitting down to write a review of this book, I don't quite know where to start." Well, I have begun mine, but upon starting it, I have realised there is nothing I could ever say about it. Nothing concrete. Nothing review worthy. Dissecting this book feels like blasphemy. Yet, I can tell you that this book is coated with nostalgia, naivete, and that je ne sais quoi of magic so characteristic of any Gaiman book (though one could argue that quite a few of them have more than that of magic). I can tell you that it's a story about a man reflecting on a period of his childhood. I can tell you it's a story of growing up. I can tell you it's a story of books, of magic, of everything and nothing. I can tell you many things, but I could never tell you the quality or what this book really is. Only experiencing it can tell you. You'll have to take hold of it, sit down, open it on page one and find the Ocean. And if you find yourself on the journey as well, don't be alarmed. I dare say we all did. 'Oh monsters are scared,' said Lettie. 'That's why they're monsters. And as for grown-ups...' She stopped talking, rubber her freckled nose with a finger. Then, 'I'm going to tell you something important. Grown-ups don't look like grown-ups on the inside either. Outside, they're big and thoughtless and they always know what they're doing. Inside, they look just like they always have. Like they did when they were your age. Truth is, there aren't any grown-ups. Not one, in the whole wide world." Durarara! is one of those anime masterpieces it’s rare to come across. As such, having picked it up randomly halfway through a fall season felt like hitting the jackpot. I’m sure those who watched it at that time know how tough it was to wait for the next episode weekly, how exhilarating it felt to see the pieces falling into place and linking the individual stories into a bigger, more intricate pattern. Much alike weaving a tapestry where the drawing could only be seen fully by the end. I’m sure many would disagree, but personally it remains to this day one of my top favourites. Attention: This review is not spoiler-free! Durarara’s plot is hard to narrow down to the essential. It is, after all, made up of several individual stories. That’s not to say that the plot is all over. It focuses on a trio of characters – Mikado, Kida and Anri - who are classmates, and it’s their meetings and adventures that shape the core of the story. It’s also deeply affected by the existence of a Headless Rider, a Dulahan. It is one of those plots that are defined really simply: people meet. Stuff happens. Some people part, some people miss each other, others are caught up in things that aren’t supposed to be possible. Try it, really: watching just the first two episodes will give you no clue about what will happen the rest of the series. Or rather, it will, but you won’t be able to see it. Similarly, it is incredibly hard to include it in a specific genre. It has a bit of everything, from mystery to romance, to comedy and drama. This broadness is certainly part of what makes it so unique and so appealing to many different types of watchers. In fact, I’ve suggested this series for people with little interest or knowledge of the anime world, only to see them hooked in three-episode’s worth of time. 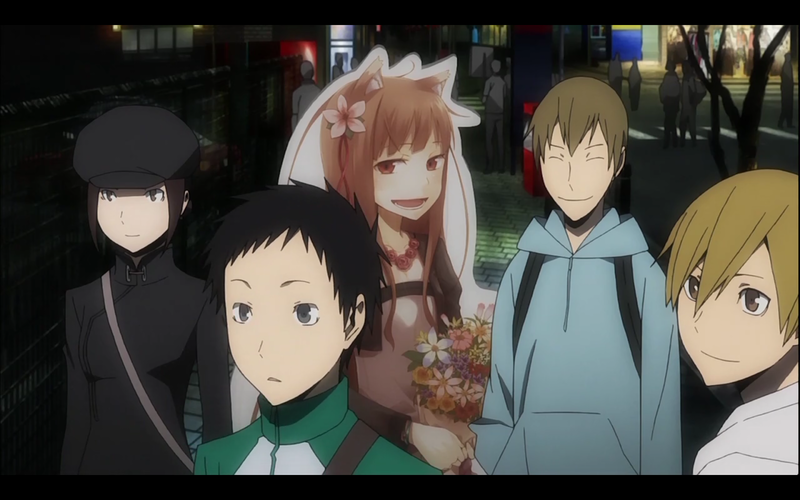 I like to think of Durarara as a tale made up of character-centered worlds. For the most part, you can only see that world, and even as you’re introduced to more worlds they’re just separate spheres to you. But as your vision broadens and they expand you start to watch them collide and interact. It is unfortunate that the series exists as a stand-alone as of now, since there are some loose ends waiting to be picked up and some characters we didn’t get to learn about yet. Fret not, though: the series has an ending. It doesn’t leave everything hanging and concludes Kida’s arc. But my personal opinion is that every fan would like to know what Orihara Izaya has in store, how Celty’s head is going to play out and how will the others be manipulated and played. 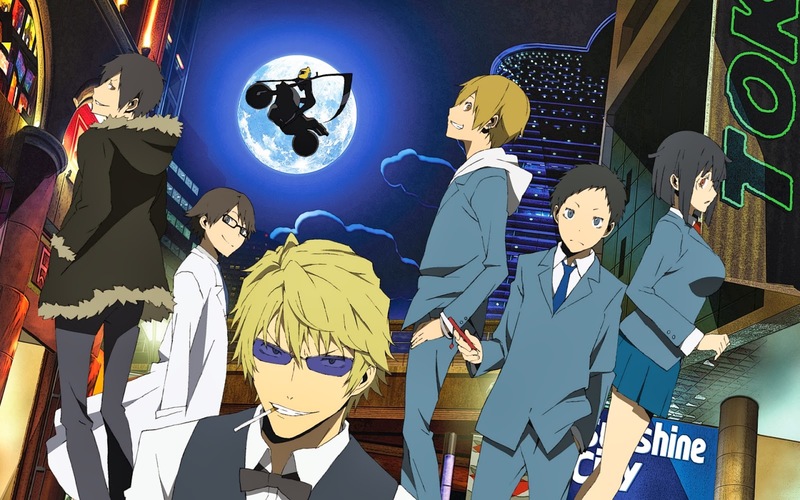 The thing that Durarara does best – and it excels in nearly every area – is characterization and character development. I have a very hard time choosing my favourite character, and even a harder time choosing a least favourite one. Admittedly, I have a thing for Izaya. But I love Shizuo just as much. 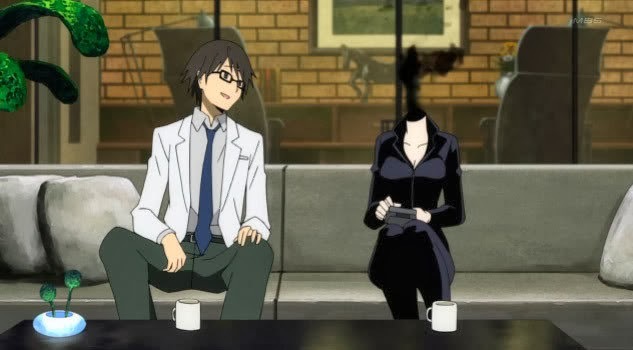 And Celty and Shinra (especially their couple-like interaction). And Kida. And Harima Mika, even though she’s a stalker. Even Mikado who looks so half-assed at the beginning is much more than he appears to be, and the same with Anri. My point is…. Good or evil, flamboyant or discrete, they’re interesting, they’re captivating. Every character is layered, amusing and rich. Every character has undertones that you didn’t see before, and you see it in a new light after a while. For me that’s particularly true for Anri and Mikado. Anri’s apparent lack of personality and willpower struck me as deeply unlikable, thus I was positively impressed when her whole backstory was revealed and she was shown to be Saika’s master. After all that mess, she became a better character as she decided that, even if her existence was of a parasite, and voluntarily so, she would try to do what she could to help her friends. Mikado, on the other hand, was not unlikable from the start. He just looked naïve, the typical main character that ends up being dragged into an adventure. He would have been alright like that, just nothing other than a cliché. However, he was not. He was curious, smart and bigger on the inside than on the outside. More importantly, he was the leader of the Dollars. Apart from these two revelations which made for incredible episodes, I loved Kida. I loved every side of Kida, his faked irresponsibility and carelessness, his serious face when he got back as the leader of the Yellow Scarves, his dark past, all of it. He’s rather complex, and even when he’s just being silly for Mikado’s sake, you get these delicious hints that something is hiding behind the mask. All of them left not only a lasting impression in me but I cherish them and remember scenes and quotes from time to time. For all of these reasons, Durarara’s characters get a top mark. Honestly, there isn’t much to complain about in this department. I know that not everyone enjoys the style of animation that Durarara has, but for me, it was the perfect complement to the rest of the series. Even now, years past, Durarara’s animation is clean cut and pleasing. It’s fluid, natural, while remaining bright and eye-catching. It’s believable while retaining a hint of unrealism, which goes well along with the supernatural bits of its story. It might not look out of this world based on the current art trends, but at that point it won easily over its competition. Conceptually, one of the bits that really caught my attention was Celty’s design. Particularly due to the fact that being headless meant that her body language had to be incredibly detailed. I take my hat off to the animators for making it so, and even going to the trouble of making her smoke vary with her emotions. The animation is even more outstanding when it comes to the materialization of the scythe. Celty is pretty much the only character that is not human, so I would have to consider myself disappointed if the animation didn’t reflect that. Character’s designs are very different in style, race and build which is pleasant to see. It’s not often that we get a character like Simon, for instance. He’s way broader and taller than the rest, his accent is different and there’s even a bit of Russian in episode 24. It was also amusing that, for a change, Kida’s hair is said to be dyed right in episode one, instead of weird hair colours being considered normal as it is so in many other series. The action scenes have their own style of animation. In that regard, I remember vividly every Shizuo scene, mostly because he tends to pick up giant city objects to throw them around. He battles Saika’s children all at once. He gets shot and doesn’t even care much. And finally, he is stabbed through his hand with a pen. Every scene with Shizuo is likely to be a memorable one. As everything else in Durarara, the music and voices were thoroughly considered so they would fit the characters and overall tone. The soundtrack, composed by Yoshimori Makoto, has fun tracks, fast-paced ones, silly sounds and creepy tunes in equal amounts. I like to listen to it from time to time, even if at some point it gets too disturbing and distracting to go on. Their insertion in the series itself is genially executed, to the point that one can’t even realize its presence sometimes, albeit still feeling its powerful effect. As for the voices, the high quality is evident in the choice of seiyuu, since nearly every popular male voice-actor has a part in the series. These people all know how to give a character identity just by changing the way they sound. I can’t avoid mentioning Ono Daisuke (Sebastian in Kuroshitsuji, Sinbad in Magi) as Shizuo, Miyano Mamoru (Yagami Raito in Death Note, Tamaki in Ouran High School Host Club) as Kida, Fukuyama Jun (Watanuki in xxxHolic, Lawrence in Spice and Wolf) as Shinra, and Kamiya Hiroshi, the god of male voices (Araragi in Bakemonogatari, Natsume in Natsume Yuujinshou, Levi in Shingeki no Kyojin), as Izaya. As for the ladies, it would be rude to forget Hanazawa Kana (Kanade in Angel Beats, Shiro in Deadman Wonderland) as Anri, and Sawashiro Miyuki (Maria in Arakawa under the Bridge, Shinku in Rozen Maiden) as Celty. Celty's voice actress gets the most honorable mention for conveying emotions perfectly without the help of character's facial expressions. With all of these golden voices, it’s no wonder that Durarara’s characters shine brighter than any others. I’ll come clean right here and now and tell you that I prefer Durarara over Baccano. I had more fun with it, I like the way the story connects way more, and I bonded the most with its characters. I recommend it to everyone I can and have rewatched it more than once. Honestly, I couldn’t have asked for something more enjoyable than this, and haven't seen anything alike since then. Ultimately, Durarara is a story of a city. With many different people and situations. With its own urban myths and problems. To quote Izaya, “human beings are the most interesting creatures that you can ever hope to find”. I also love humans, and I appreciate a story that can present that to its fullest. The Specials: This series has good specials, those that are worth watching. While not essential to the main plot, they are introduced seamlessly into the time-line, corresponding to episode 12,5 and 25. They aren’t worth a 10/10, but they’re good fun. You get more Izaya vs Shizuo, more of the same fun without any drop on the animation, sound or character quality. However, it goes without saying that there’s less depth to it. They would be a good standpoint to introduce a new season, nevertheless, as there are new seasons being introduced, such as Izaya’s younger twin sisters. Lots of stuff to do, and 232 stars to collect. 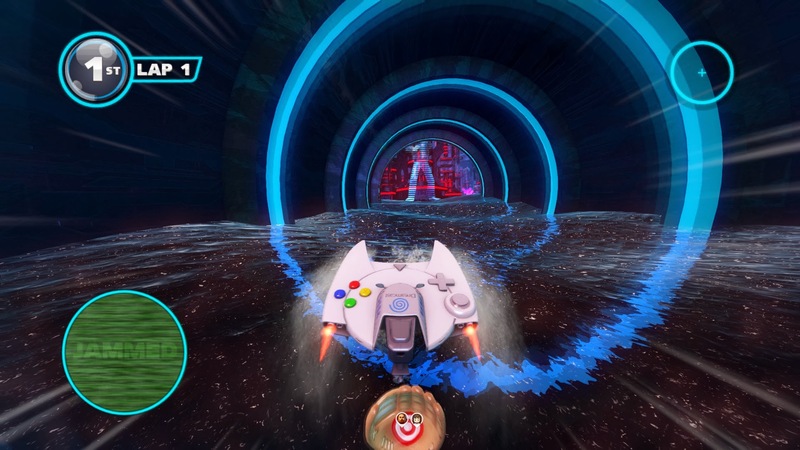 So, here we are presented with characters from many of SEGA’s beloved franchises, each one with their unique vehicle and seven different Mods (basically configurations that change things like the speed, boost and acceleration of the vehicle) which are unlocked as you level up the characters and progress in the World Tour in Career mode. This works as the ultimate fan service, since it lets you control good old characters like Vyse and B. D. Joe (this last one in his faithful, and now, transforming yellow taxi) and many others, while still having characters from recent franchises, and of course, Sonic and friends. The rooster consists of over thirty characters (if you include the DLCs), and in addition to SEGA characters, there are some special appearances, like the Team Fortress character and more recently Yoggscast (most of the characters added are exclusive to the PC version). One of my favourite transformations, complete with sound effects and all. 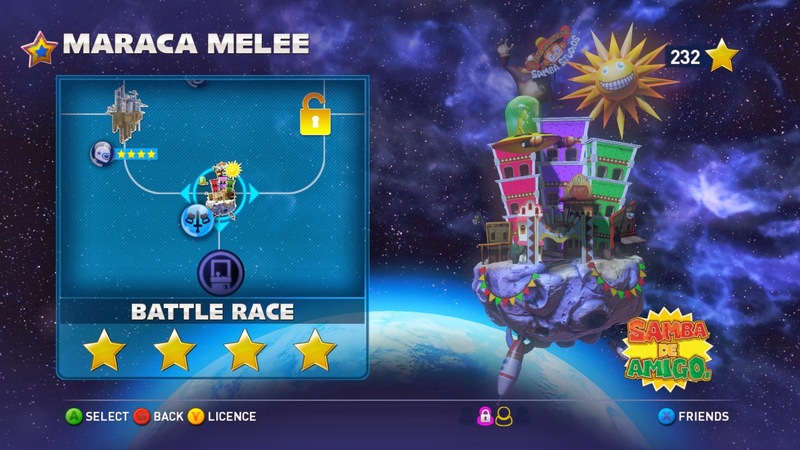 There’s a lot of variety in terms of game modes, more so than in your average cart racer. All of the basics are here, Career mode, Matchmaking, custom event, etc, and inside each mode, there is yet more variety. Inside the World Tour in Career mode, you get to collect stars by completing events, and the higher the difficulty you play in, the more stars you unlock (initially there are three difficulty levels with a fourth one unlocked later). 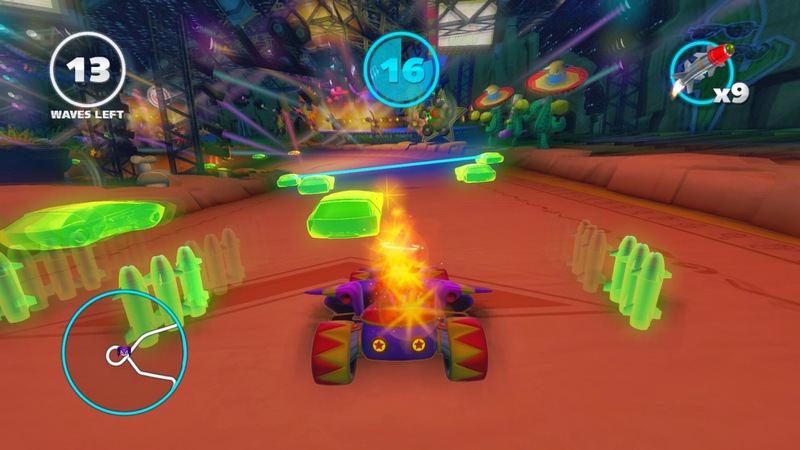 There are several types of events, like regular races, one-lap sprints against ghosts, Bosses who throw obstacles at you and must be defeated before you vehicle falls apart, boost races, traffic attacks and the list goes on. The tracks themselves are also from SEGA franchises of course, and in none of them will you be driving on solid ground all of the time. Most, if not all of the tracks change on their final lap and even before then there might be water/lava or air sections. Here your vehicle will transform to suit the environment, and by doing this, changing the way the controls feel (driving a wheeled vehicle in the road isn't anything like driving a hovercraft on water). 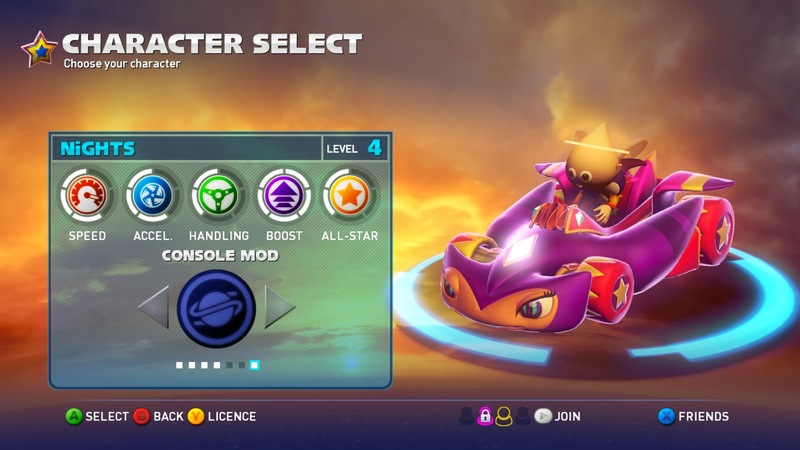 In addition to these three different forms your vehicle can take, one of the game’s power-ups (All-Star) changes you into a fourth appearance, granting you invincibility and a speed boost for a limited amount of time. The other power-ups are within what you might expect for this sort of game. Rockets and snowballs to throw at your opponents, boosts, homing missiles that look like a miniature version of you and the Blowfish, which works as a bomb, which you can leave in the road or launch forward. There are also baseball gloves which grab whatever others might throw at you and lets you keep it so you can then throw it back. Traffic Attacks are one of many challenges present and can be pretty insane. Having your vehicle transform into four different shapes gives the game a great deal of variety. That, combined with the fact that most of the tracks change every other lap, makes it so that you don’t feel like you’re always doing the same thing. Having seven different mods for every character makes it so you can use whatever character you like, even if you can’t deal with the way it initially plays (lack of handling / acceleration / speed / etc). Has a decent amount of tracks (and of course, mirror versions) but could use some more. One of the DLCs added an extra track, but since not everyone has it, it never gets selected in online matchmaking. In addition, the new track feels pretty bland, there aren’t many obstacles or variety at all. S class is pretty damn hard, mainly due to abusive amounts of rubberbanding. But once you master those tracks, it’s an awesome challenge and feels pretty rewarding to win. However, even S class isn’t much compared to online matchmaking, especially if you put yourself in a lobby full with players with their ranks in the 1500’s or above. S class challenges are also pretty difficult and require practice most of the time. Seven mods p/character guarantee a good amount of customisation. The online matchmaking itself works pretty well and it’s fun, but there’s (arguably) too much time between races. Ten seconds to vote for one out of three tracks, and then forty-five seconds just to choose a character is too much. Also, don’t make me choose my character after every race. Just give me the same one I used in the previous one by default. If I want to change into another one, I can…after all, I have forty-five seconds to do it…. 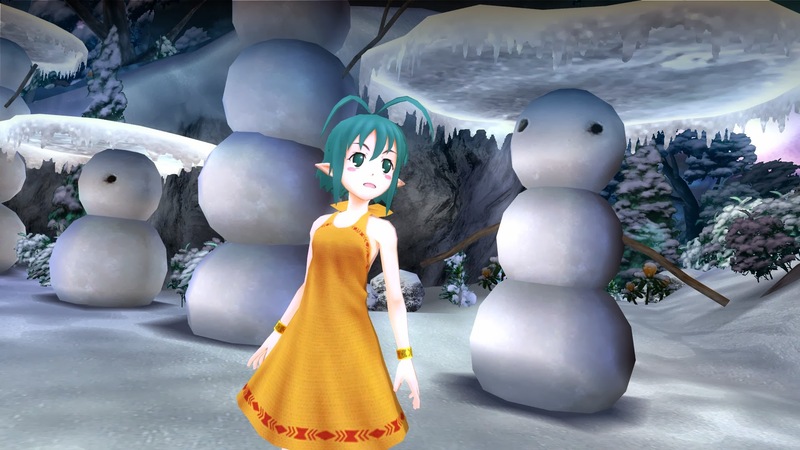 Speaking of characters, the AGES character comes as a pleasant surprise, with its unique sounds and transformations which you’ll no doubt recognize. 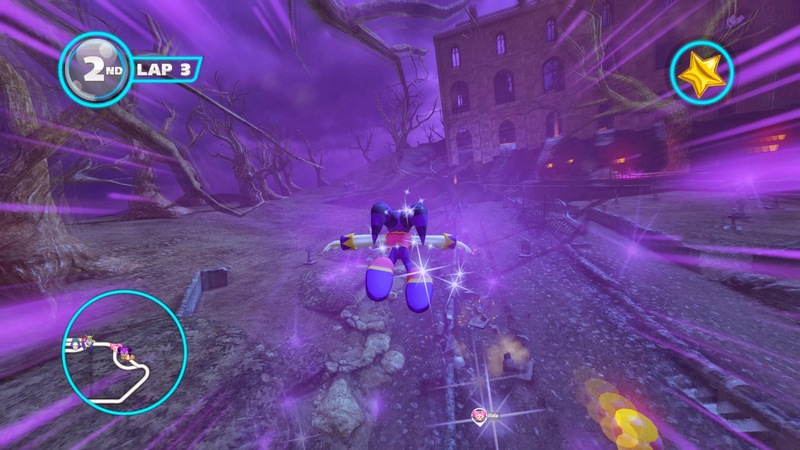 On the other hand, having NiGHTS and Reala in the game AS THE vehicle feels like a bad joke. At least their All-Star transformations look good. There’s a healthy amount of achievements, even though it would have been cool to see every in-game sticker have its own. Some achievements involve playing with four local players, which is not a good idea. Not many people have that amount of controllers, not to mention the fact that split-screen multiplayer is becoming a thing of the past. It would have been more sensible to make these achievements doable with Steam/PSN friends. The game runs great and looks amazing and crisp on PC, but as usual with sonic PC ports, there’s a specific zone (in this case the Samba Studios track) that tends to drop the framerate. That being said it’s still a pretty good port, but still suffers from the same problem as all the other sonic PC ports that came before it: the graphical options menu is in a separate executable and must be run before the game. Also it forces you to skip through a bunch of stuff before you get to the main menu every time you launch the game but at least on the PC, there’s a fix for that. As a conclusion, this is definitely an extremely satisfying and challenging game, especially if you have a couple of friends to play online with. SEGA will certainly milk this game some more by slowly adding more characters as they’ve been doing in the past. This is reinforced by the fact that the game is still selling and the online community is still pretty active. The game isn’t expensive and has been on sale again and again, with prices reaching under 7€ at times. Definitely a good buy for any fan of SEGA and/or kart racers. 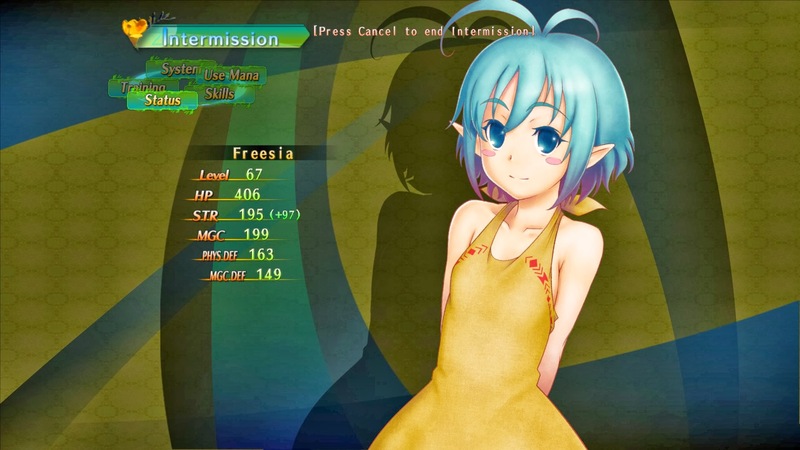 Made by Doujin developer Edelweiss, Fairy Bloom Freesia is a game reminiscent of old-school action sidescrollers. 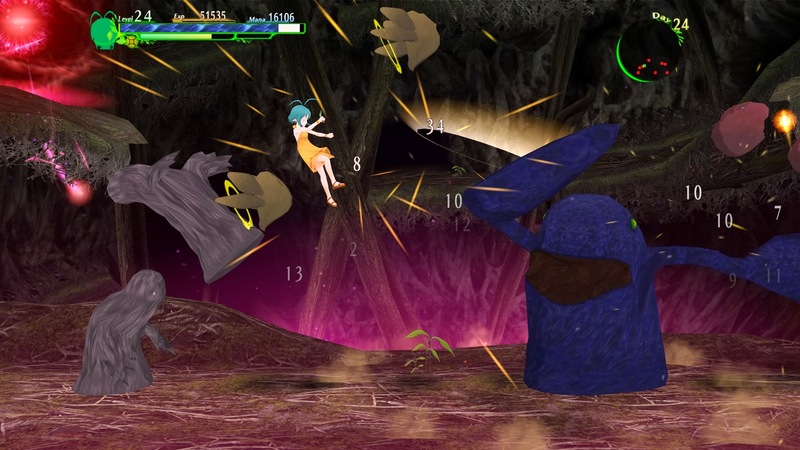 The base idea here is that you control a fairy (Freesia) and fight off incoming waves (or in this case, a rain) of enemies in forest-themed environments in an attempt to protect said forest. So it’s a simple game with a simple story: Freesia lives in the Lita Forest and does her best to protect it from both creatures and humans, who both threaten it. Freesia “has a very strong fairy-fu” and is friends with the ancient Jomon Tree, which holds a great power and keeps the forest alive. Starting here, the story revolves around how freesia defends the forest and the challenges and enemies she will have to overcome when the humans come and attempt to take the power possessed by the Jomon Tree to themselves. If used correctly, certain enemies may be used to help you get rid of other enemies. I played using an Xbox360 Controller, so my special skill button was Y. From here I have four slots for four special skills which are used by tapping one of the cardinal directions on the analog stick (or d-pad) together with the Y key. The other buttons are for simple attacks, guarding and jumping. Guarding at first is simple at first, but as you face stronger enemies you will have to learn how to use it more efficiently since you can only guard against a certain amount of damage at a time. In addition, you have 2 bonus slots which you use to equip enhancement skills. Like for example a simple boost to Freesia’s maximum health, or a regeneration ability, which continuously and slowly regenerates your health (good for longer levels for example) or others like, for example, an ability that increases Freesia’s damage output the lower her health is or one that instantly fills your health up when it reaches zero just once, giving you a second “life”. There are many to choose from but only 2 slots, so you might want to change those depending on what kind of level you are trying to clear. Some of these abilities are one-time buys (you buy it and that’s it), but most have several ranks and require you to spend more mana on them so they reach their full potential. Time to check our progress. The first thing that comes to mind is that character names are awful. Freesia is acceptable, but Shinye sounds weird and Listine sounds like mouthwash. The design isn’t bad though, and the characters are likeable enough. The scenarios are decent but not great in number so they eventually become repetitive as you go through level after level after level without anything changing around you. The enemies have the same problem, there’s only a handful of different ones, which you will be facing ad nauseam in waves. The difficulty is pretty solid, especially if you play on Cruel mode and the extra modes are challenging as well and require some practice, especially the levels where you have to defend the rifts. It took me quite a while to get past some of them in Hard difficulty, but after that when I went into Cruel I already had the tactics down so it was easier. The bosses are challenging as well, at least until you learn their attack patterns. From there on you can avoid damage completely as long as you are careful. That being said, I liked the game, it was all about frenetic fun and slashing through endless hordes of enemies, levelling up, gaining new skills and going through the story. If you want a decent and challenging button masher (heh), you might want to get this one.